Breeding is not an exact science – Mother Nature is involved. As a result, sometimes the timing of a female’s heat cycle or an expected litter’s coat colors or markings don’t always match exactly as we had planned. We can estimate heat seasons and predict color percentages and markings of a litter, but Mother Nature makes the final call. We strive to select pairings of adult dogs that will produce wonderful temperaments and color combinations, but we are always thrilled with the puppies, no matter their colors or patterns/markings. When you put down your deposit, you can select a particular litter if there is an opening on the reservation list. Deposits are always transferable to a different litter. JoaLins reserves the right to use a different stud than originally planned as it may be necessary at times to replace a stud or create an entirely different pairing of a dam and sire due to the interference of Mother Nature. In the event we replace a stud or a future pairing, we will make every effort to ensure the same colors and sizes expected for the litter, however this may not always be possible. JoaLins accepts 5 deposits per litter, and reserves first right to retain 2 breeding quality puppies from any of our litters for our breeding program or other breeder’s programs. 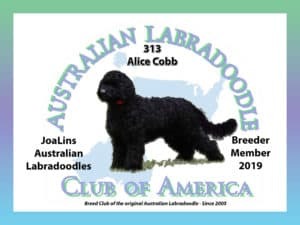 It is not uncommon for our reservation list to fill up quickly, so please take the time to fill out and submit an application and make a deposit to reserve a spot if you are interested in adding a future JoaLins multi-generational Australian Labradoodle puppy to your family!! Click here for the application. Questions? Need more information? Send us an email using the form under “Contact Us” or call (813) 449-3359 during our office hours listed on our “Contact Us” page. Between puppies and family, we can't always answer the phone, but please leave a message or let us know by email that you'd like to talk and we'll get back to you promptly. We are super excited to announce that Kesi (Tampa Bay Labradoodles Double Shot of Espresso at JoaLins) will be honeymooning soon with Lakewood's Sampson. Special thanks to Lakewood Labradoodles for allowing us to use the amazing Sampson as Kesi’s mate for this pairing. These puppies should be large mediums to small standards, with an expected adult weight of 35-45 lbs. Coats will be allergy-friendly, non-shedding and colors can include caramel, chocolate or black . . . with the potential for white markings. When these stunning puppies go to their furever homes around late-August they will come with a 2-year health guarantee, be microchipped, have their first round of vaccinations, and will be registered with the ALCA and the WALA. We just know these pups are going to steal everyone’s hearts! We are currently accepting reservations and deposits on this litter. More information and pricing can be found by clicking here.